Diamonds are still the most popular gemstones in the world and they are in the highest demand among wedding related gems. But thanks to their history, business model of production and impact on the environment they are also very controversial. The quest for a decent alternative is almost a century old. With moissanites it looks we finally got some competition. Moissanite is a naturally occurring gemstone, discovered by a French chemist and a Nobel-Prize winner Doctor Henri Moissan. He found it in Arizona, USA, among the remains of the meteorite, crashed on Earth about 50 thousand years ago. Tiny shiny parts with unprecedented brilliance got Moissan’s attention. He had to make numerous experiments before the chemical structure of the substance was revealed. It is a silicon carbide (SiC), what means it has similar basic elements as the hardest substance on Earth – a diamond. Silicon carbide indeed has a potential to form crystals with structures which are almost the same as diamond structures. This is a structure of tetrahedron, where the atoms are the most evenly distributed in space, what makes a tetrahedron especially stable. 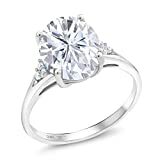 While diamond consists of carbon atoms only, moissanite is made from carbon and silicon (the later being essentially the same as atoms of carbon from crystal point of view). This opens a very interesting opportunity to find a gemstone with characteristics comparable to the most popular precious stone of all times. Can we compare both gemstones in a table? As we can see, moissanite is slightly less hard than a diamond (still much harder than a steel file, what makes it very durable and suitable for extreme conditions like usage in tools or jewelry), but it surpasses a diamond (and every other known precious stones in brilliance and fire, both most desirable characteristics of gemstones used for rings, necklaces, bracelets etc. ), except for color. Until recently a perfectly colorless moissanite was virtually impossible to get, yet latest brands like Forever One and Forever Fire managed to get very close to almost colorless gemstones, which always indicate perfection and flawlessness. There is also a very acceptable price tag. On average moissanite is between 80 and 90 percent less expensive than a diamond of the same appearance. Unfortunately, moissanites, found in nature are too small for decorative gemstones. They are also too rare, much rarer than diamonds. They were found only at meteorite craters and while the idea of using them in jewelry existed since 1905 when George Kunz (expert working for Tiffany) suggested the name moissanite for the mineral, found by Henry Moissan, almost a full century passed before this became possible. Thanks to the natural occurrence of moissanite, it eventually got a nickname – a space diamond. Synthetic Moissanite Enters The Scene! In the late 1980s and especially in the 1990s serious attempts to produce large single crystals of moissanite were made. After several years of research, Charles & Colvard succeeded to produce first gemstones with brilliance and fire as we expect at the top notch gemstones. Today they are still a leading producer of these precious stones coming from the laboratory. Of course, many problems occurred by the way. For instance, not all the cuts available at diamonds were suitable at moissanite. They started with round brilliant cut and other shapes like cushion and emerald were added later. While diamonds were (and still are) always cut in the way which maximizes their weight, moissanite jewelers were always focusing on maximizing their luster and shine. This approach eventually led to the interesting situation where ’fake’ diamonds became superior to the originals. Diamonds as a group of gems carry a large ethical baggage. They are historically by far the most problematic gemstones, causing many wars and human suffering. A significant part of today’s world production of diamonds comes with a ’conflict-free’ label but many diamonds are still made by exploitation of workers, with devastating effect on nature and their production is supported with extreme violence. Jewelry manufacturers are well-aware or all these problems and Kimberley Process was established to solve all the conflicts related with diamond. Unfortunately a majority of mines are located in politically unstable and difficult to access areas, where unsafe conditions and work for less than a dollar per day are still the way to go. None of these issues were ever addressed on moissanite gemstones. Each one of them is made in a lab, all workers (we should say engineers) and taxes are paid and full procedure, from the initial crystallization seed to the end buyer who pops the »Will you marry me?« question. To be honest, moissanite are not the only alternatives to diamonds. We should mention at least one huge group of stones especially popular in the wedding industry – a cubic zirconia. So where is the difference between cubic zirconia and moissanite? If we compare moissanite with cubic zirconia, we soon discover it is superior in all areas (durability is definitely important) except at the price and the color (the later will be addressed in next section). While moissanite looks a bit pricey comparing with cubic zirconia, we should know there is significant know-how built-in in the price tag. We are dealing with the state of the art technology, lots of experimental work done by top authorities in mineralogy, inorganic chemistry, crystallography and other hi-tech areas. Advanced computers and superb robots are used for analyzing the products perfectly cutting gemstones for a still relatively small market. Which Characteristic Of The Stone Is Most Important To You? In a few years the price will definitely go down and quality will be even better, what can be seen with new brands of moissanite. That leads us to the next chapter – the color issue(s). It's always ungrateful to making any predictions, yet if we were forced to find the best alternative to diamonds, moissanites look as the most believable winner in the area of wedding jewelry. Is There A Totally Colorless Moissanite? Until recently all moissanite possessed a small amount of greyish or greenish (green is particularly characteristic) occlusions, what puts them in the range of F or lower comparing with diamonds (D is considered as the best possibility on the market). It is important to know such diamonds are meant just for white gold, platinum or similar settings because yellow one would neglect the colorlessness of the stone. For this reason, numerous buyers don’t really care about the grade of color, because they plan to put the stone in yellow, rose or similarly colored setting anyway. Diamond graded between G and J is considered as a best-buy option for such buyers and having lots of moissanite with way better grades this problem is relatively unimportant. On the other way, the market for colored stones is growing. If somebody wants blue, green, yellow or pink stone, moissanite offers at least as much as colored diamonds. In this case, gradation is completely different than the one presented above. There is another important fact to consider. Technology for making moissanite is improving year after year and several enhancements were made – leading to Neo, Supernova, Forever Brilliant, Forever One and the ultimate compound of silicon and carbon grown in star-like conditions: Amora Gem. Amora Gems surpass diamonds even in their traditionally untouchable category – hardness, but are in such demand, you have to enter a waiting list if you want to buy one. For several decades cubic zirconia was the only important alternative to diamonds. This lovely inexpensive stone is built in nice, yet sometimes relatively unattractive jewelry, which is relatively easily scratched and the stone as the main attraction with time pretty soon becomes somehow dull (it looses luster). With moissanite, new attractive alternative entered the market, where a fresh generation with different economic, ethical and environmental values, accepted it as a new standard. We’ll very likely change the famous »Diamonds are forever« with another one with moissanite in. All used photos and clip arts are Public Domain and both tables are my own work, published under the Creative Commons 4.0 license. As far for diamond alternatives are considered there is still a lot of to explore, especially for stones larger than two and a half karats and we are looking forward to finding out what will the future bring. What Do You Think Of The Moissanite? Great to hear that, LPerry. I like sparkles (all kinds) as well, but moissanite has one important advantage - durability. I have to admit I hadn't seen one neither. It's rarer than a diamond after all! Anything that sparkles is quite alright with me :) I would love to see a Moissanite stone in real life. Great article!